Unless you have 100% customer satisfaction ... you must improve. It is not who is right, but what is right, that is of importance. Anyone can make the simple complicated. Creativity is making the complicated simple. Katarína studied both international economic relations and diplomacy at the Bratislava University of Economics School of Commerce (Bratislava, Slovakia), from which she graduated with a master’s degree in 1999, and law at the Comenius University School of Law (Bratislava, Slovakia), from which she obtained a master’s degree in 2000. 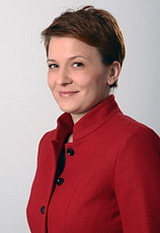 She also earned a PhD degree in international relations and law from the Bratislava University of Economics School of International Relations (Bratislava, Slovakia) in 2010 with a thesis on resolution of international investment disputes. In 2013, she completed a LL.M. program in international legal studies at the Vienna University School of Law (Vienna, Austria) with a thesis on conflicting decisions in international investment arbitration under the supervision of Prof. Dr. Christoph Schreuer. She was admitted to the Slovak bar as an advocate in 2004. Besides being a native Slovak speaker, Katarína speaks fluent English, German and Czech and has a good command of Russian and a basic command of French and Croatian. Prior to joining the firm as an of counsel in 2011, Katarína worked as an associate for the local branch of a law office affiliated with a Big Four firm, a local law firm in Bratislava (which has been a local correspondent firm to a prominent global law firm) and the local office of a leading German firm. She is also a postdoctoral fellow at the Bratislava University of Economics School of International Relations, where she teaches courses in international public law and international economic law and does research in the fields of international investment law and WTO law. Katarína specializes in merger and acquisitions, corporate law, commercial contracts, real estate and employment law. Her expertise also includes protection of foreign investments and international investment dispute resolution.